Not sure what to make of these. Both have an irridised base. I can't really see the base colours as it's irridised all over. I'm not even sure what the outside colour is actually. :? There are a few small chips on the jug but the suger is perfect. Any clues as to who made these two items and date, etc... please? These are puzzlers - I've been trying hard to figure them out but I'm not a lot closer to providing you with an answer. Best if I tell you in general terms what I think. Both items appear to be Contemporary (Modern) Carnival. At first, I though that the covered sugar (or bonbonniere) might be a Riihimaki/Kauklahti piece which has a similar pattern concept - but a close comparison showed that it is not. You have given us the main piece of evidence however, Tigerchips - as you noted that the bases are iridised all over. I would say that does show they are Contemporary items. (Date of manufacture sometime between c. 1970s to today). There is a huge amount of Contemporary Carnival in existence. Is there any sort of trademark anywhere on either of your pieces? And can you confirm that the base on neither piece is ground? 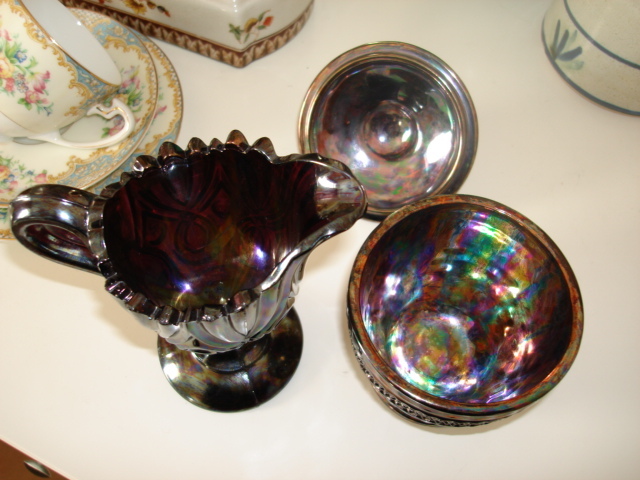 You noted that the base colour is very hard to detect because of the depth of iridescence. From your photos it seems (can't be sure, of course) that the creamer is purple and the covered piece is blue. 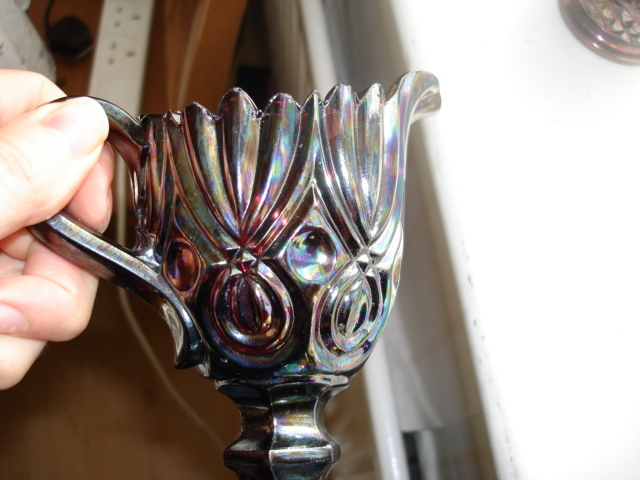 I have found a wine glass that was referred to as "Heritage" pattern, but no maker suggested. The pattern does look like that on your covered piece. It has a hint of Westmoreland in the style, but I don't have a reference that shows the newer Westmoreland items. Hopefully someone else will have seen these items before and can give us some more information. Very interesting pieces - I wish I could give you "chapter and verse" but I can't at the moment. I'll keep looking. 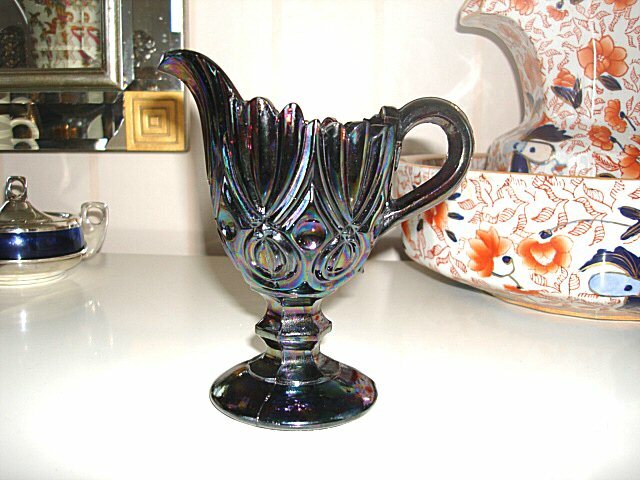 Inside the jug, when I hold it up to the light, there is a sort of crackling effect to the iridescence. Inside the cracks it appears that the glass is clear, it's probably just a trick of the light. This clear glass cannot be seen where there are chips, actually the chips look irridised. :shock: Also, the jug has two straw marks, one on the outside and a big one in the centre. There are no tradmarks and the lidded suger is not ground. The jug however, has what appears to be a 0.2mm thick ground ring on the base. A largish flat chip on this ring looks to be a grinding chip. Next to the centre near the star, this might also be ground as there are flat chips there two. When I get back from work, I'll post a picture of the base if you need it. Aaah! I think it could be LGW. Your extra info suggests that could well be the case. Check out what I said here, Tigerchips and see what you reckon? The fact that you can see some clear glass suggests that's what it is. Thanks Glen, if there is no other company that does this then I think that's what it is. The lidded sugar also appears to be clear glass or very light blue with the iridescence making it look darker. The same maker perhaps?. 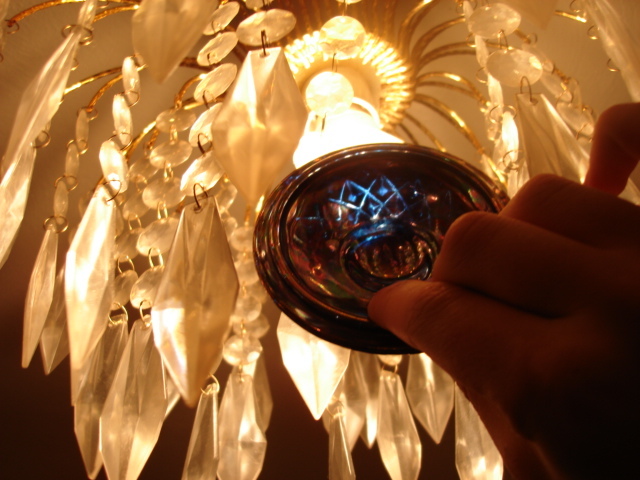 I had to put a light bulb inside it to find out. 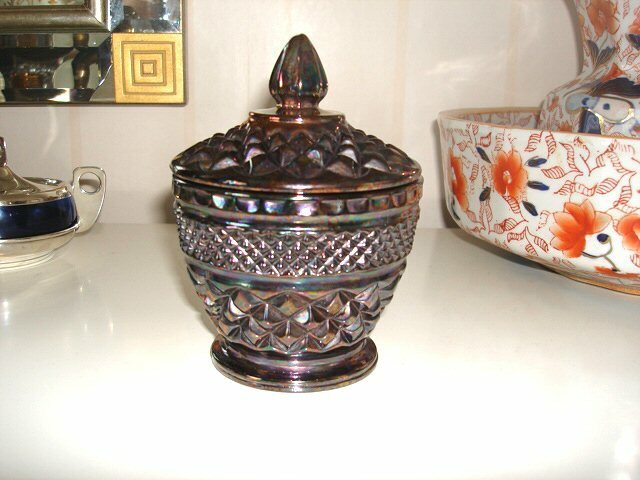 The lidded sugar appears to have a more coppery kind of iridescence. I think it's odd that all of the chips on the jug - including the one's on the rim at the top of the jug- are all iridised. Why would LGW decorate an already damaged piece? :? LGW are certainly the only people I am aware of who used this technique. 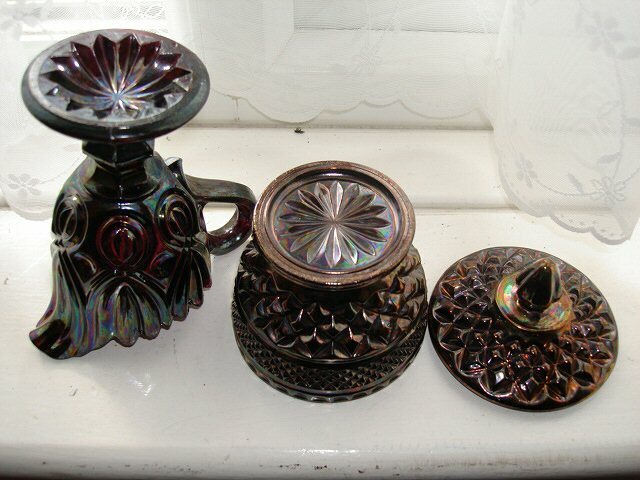 It would appear they used glass from various makers - I recently got a vase that I believe was a Cristal d'Arques one, that LGW then iridised. The ground rim on your creamer underlines a likely European origin (rather than USA made Carnival) so I do think that this is the answer. I guess they had a batch in and didn't spot the chips. But certainly the fact that the chips are iridised over does indicate the vacuum iridising method (post original glass production). On another, slightly deviant but sort-of connected, note. There are/were people in the USA who re-heated already made items and then iridised them. The technique took great skill and experience. Names to look out for are Crider and Hansen. PS Nice pieces, by the way, that sugar and creamer. Very distinctive - very unusual. It cannot be that hard to add iridescence as Pirelli did it too. Who said it was "hard" to iridise? The method and processes are well known. "the technique (that) took great skill and experience"
For example, Terry Crider used cold "blanks", re-heated the items to 1000 f, then iridised, and heated again in a glory hole. He told me that when he first began iridising blanks, everything took two applications and two separate firings. In fact some pieces took three applications and three firings. As Terry told me "there were a lot of breakages this way"! That's what I was referring to in my posting above. The LGW method was vacuum iridising. 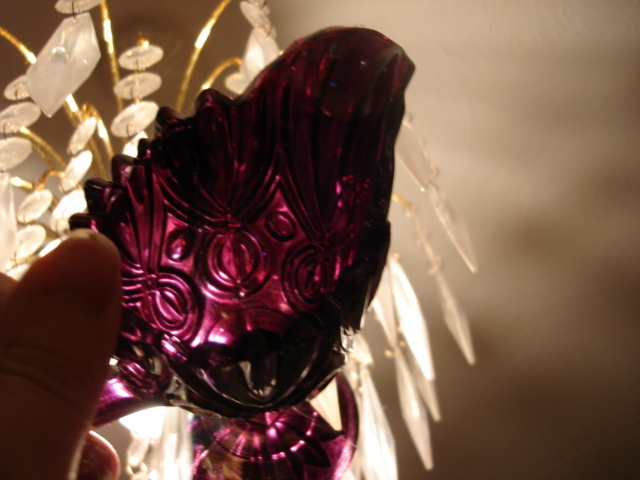 I am not aware of anyone else using the method - and the result is a very vibrant and easily recognised iridescence. Thank's for all your help Glen, very much appreciated. I'm glad you like them too. . Unfortunately no details of PirellÃ­s equipment is known but as the bulk of their work was firing transfers, it is likely that they only had an annealling oven. I dont think they fore up that hot to fuse the transfer enamels. Not had any of the iridised glasses myself so I cannot test if it scratches off.